Portsmouth Valkyries are raring to go for Sunday’s trip to Reading after a break from action. Head coach Mark Witcher is expecting the home side to show they have plenty of power. But Valkyries are second in the Women’s National Championship south east west one table with five wins from five. They will be confident they can add another win to their record. Witcher said: ‘Reading have a strong pack, with solid runners in the middle of the park and pace out wide. The Valkyries are on 23 points, two points behind leaders London Welsh but with a game in hand. 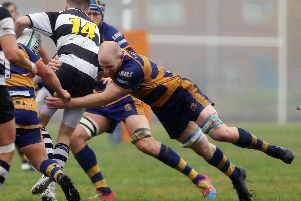 With their league game against Witney called off by their opponents Witcher and the other Portsmouth coaches took the opportunity to watch the second team in action last weekend. They faced a young and enthusiastic Winchester University squad. The Valkyries boss added: ‘I was impressed with the way our ladies conducted themselves in what turned out to be a fairly comfortable 57-10 win in a competitive match. Scrum-half Kelsey Suggett was impressive in her first game in that position and, among the forwards Leah Lind and Rosie Staples were outstanding. Sophie Harris, an 18-year-old with a bright future, started on the flank and also impressed the coaching staff. Full-back Dani Burgess ran in four tries, showing great speed and lines of attack. With several players returning from injury the battle for first team places will be intense in the coming weeks. Witcher feels this will really help the club continue developing. He said: ‘I was very happy to see more of what we have worked on in training being used in match situations.